Abu Dhabi has officially been selected to host the 2019 United Nations Industrial Development Organization (UNIDO) General Conference (GC), the organisation's supreme policy-making organ which convenes every two years. The announcement was made following a vote by the 53 member states of the Industrial Development Board (IDB) at their 46th annual meeting in Vienna where they convened to review the implementation of the UNIDO work programme, approve budgets, and make recommendations to the General Conference on policy matters. The consensus is a testament to the growing confidence in the UAE's role in shaping the future of manufacturing, and its development of a robust industrial base as part of a national vision for a diversified, knowledge-based, highly productive and competitive economy. Since becoming a specialised agency in 1985, UNIDO has never hosted the General Conference in the Middle East, and only hosted it away from its Vienna headquarters three times: in Bangkok, Thailand (1987), Yaoundé, Cameroon (1993), and Lima, Peru (2013). 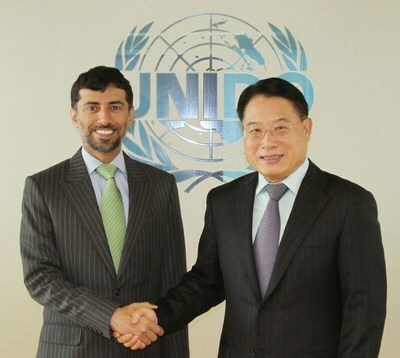 UNIDO and the UAE have a long-standing relationship, with both serving as co-chairs for the Global Manufacturing and Industrialisation Summit (GMIS), the world's first cross-industry platform that gathers leaders from public and private sectors and civil society to harness the Fourth Industrial Revolution's (4IR) transformation of manufacturing to the regeneration of the global economy. The platform has seen Abu Dhabi emerge as a leader in driving this transformation, and hosting the UNIDO GC will build on its continuous efforts and initiatives, which seek to shape the future of manufacturing while promoting industrialisation for poverty reduction, inclusive global development, and environmental sustainability. The General Conference is scheduled to be held at the end of 2019 and will be preceded by UNIDO's Least Developed Countries (LDCs) Ministerial Conference. As the world's largest donor of official development aid relative to national income, a leader in smart strategies, and a strategically positioned geographic location between East and West, the UAE has continuously demonstrated its commitment to contributing to the achievement of the UN Sustainable Development Goals (UN SDGs). Home to the ministerial Fourth Industrial Revolution Council, a first of its kind in the world, and co-chair to the Global Manufacturing and Industrialisation Summit, hosting the UNIDO GC in Abu Dhabi will allow countries to benefit from a global pool of capabilities and enhance their understanding of, and preparation for, the impact of the Fourth Industrial Revolution. According to data from Oxford Economics, from 2007 to 2017, the UAE's industrial sector (which includes extraction, manufacturing, utilities and construction) has grown by more than a third, and is forecast to grow by another third over the next decade. An integral part of the global supply chain, companies in the UAE such as Strata Manufacturing, the region's only aircraft parts manufacturer, Emirates Global Aluminum, which was the world's largest 'premium aluminum' producer in 2017, and defence vehicle manufacturer NIMR Automotive, have proven their capabilities and evolved into global players in knowledge-based and cutting-edge sectors. Following the announcement, His Highness Sheikh Abdullah bin Zayed Al Nahyan, Minister of Foreign Affairs & International Cooperation, affirmed the UAE's commitment to enabling inclusive and sustainable industrial development as a catalyst for economic and social prosperity, and commented on the occasion: "Selecting Abu Dhabi to host the 18th UNIDO General Conference reflects the international recognition of the UAE's significant role in supporting the global industrial sector to achieve the Sustainable Development Goals of the United Nations. The UAE remains a pioneer in the Fourth Industrial Revolution and continues to bridge and connect civilisations between the East and West. Through its partnership with UNIDO in the Global Manufacturing and Industrialisation Summit, the UAE is well-positioned to play a strategic role in shaping the future of the global manufacturing sector." UNIDO Director General LI Yong said: "We highly appreciate the generous offer of the Government of the United Arab Emirates to host the eighteenth session of the UNIDO General Conference in Abu Dhabi. I look forward to further strengthening our ties, especially since UNIDO and the United Arab Emirates share the commitment to take a transformational approach towards shaping the future of manufacturing and jointly co-chair the Global Manufacturing and Industrialisation Summit." His Excellency Eng. Suhail Mohamed Faraj Al Mazrouei, UAE Minister of Energy & Industry said: "The UAE has flourished in a relatively short period of time since its establishment, but many challenges had to be overcome to achieve this. Our founding father, the late Sheikh Zayed bin Sultan Al Nahyan had the vision to leverage oil wealth to build a prosperous nation and enhance the welfare of UAE citizens, developing what are now world-class healthcare and education systems, and a globally competitive economy. This vision, however, was not exclusive to the people of the UAE; in the midst of the country's renaissance, it arose as a leader in international cooperation and in the provision of humanitarian relief and development support to those less fortunate across the world. "Clearly, spreading global prosperity is deeply instilled into our belief system, and unlocking the potential of the manufacturing sector will support our efforts; it has always been a key contributor to social and economic welfare, and is instrumental to the achievement of the 2030 Agenda for Sustainable Development. However, the 2030 Agenda is being carried out at a time when the lines are blurred between the physical, digital, and biological spheres. The developments that the Fourth Industrial Revolution brings must be exploited to ensure prosperity is shared across all societies, particularly in developing countries. This is something we have been focused on delivering through the Global Manufacturing and Industrialisation Summit with UNIDO as our co-chair, and we have no doubt that our efforts will be amplified by hosting the UNIDO General Conference in the UAE." The Emirate of Abu Dhabi has been instrumental in the UAE's efforts to drive industrial development, with the Department of Economic Development - Abu Dhabi (DED) having shaped the Emirate's Industrial Strategy 2011-2015. The DED also established a department focused on the development of the industrial sector, and cooperated with government and semi-governmental bodies to update the industrial strategy of the Emirate of Abu Dhabi 2016-2020. His Excellency Saif Mohammed Al Hajeri, Chairman of the DED said: "The Emirate of Abu Dhabi's economic diversification roadmap - Abu Dhabi's Economic Vision 2030 - has set out a goal for the non‑oil sector to raise its contribution to GDP from 41% in 2005 to 64% by 2030, and the development of the industrial sector is specifically recognised for its vast potential to contribute to this goal. We have already made headway in achieving this objective, with the sector's contribution to GDP in the Emirate of Abu Dhabi having increased from 5% to 7% in recent years. This is a clear demonstration of the success of the Emirate-wide industrial strategy, which aims to attract foreign direct investment and facilitate a smooth transition to a post-oil economy. "Collaboration is key to achieving our vision, and we are honoured that Abu Dhabi was chosen to host the UNIDO General Conference in 2019. We look forward to welcoming the UNIDO Member States to Abu Dhabi, and to discussing how the sector can drive competitiveness and social welfare all over the world." Badr Al Olama, Head of the Organising Committee for the Global Manufacturing and Industrialisation Summit (GMIS), said: "GMIS was established with a strong conviction and mandate to make the Fourth Industrial Revolution fully inclusive, harnessing its potential in manufacturing to make the world a better place for all. We have made great progress with UNIDO and the UAE Ministry of Energy & Industry as co-chairs of GMIS, and have attracted interest from stakeholders all over the world who share our commitment. As a cross-industry platform, the tangible outcomes that GMIS has delivered have been made possible through global collaboration and partnerships. "The Fourth Industrial Revolution is seeing disruption across all sectors, and GMIS' approach is to empower the manufacturing sector to not only deploy new technologies, but to anticipate and leverage such disruption to the sector's benefit and in a way that maximises social and economic impact. As such, we are absolutely thrilled to be hosting the UNIDO General Conference in Abu Dhabi. This is a new milestone for GMIS, and marks the beginning of a new era in which policy-makers address anticipated changes to the sector, and channel them towards achieving global prosperity, in line with the UN Sustainable Development Goals." The UNIDO GC will take place at the end of 2019 in Abu Dhabi. As the host country to the UNIDO GC, the UAE will have the opportunity to nominate a President for the GC and recommend a theme for the conference, both of which are currently underway. UNIDO is the specialised agency of the United Nations that promotes industrial development for poverty reduction, inclusive globalisation and environmental sustainability. As of 17 May 2018, UNIDO has 168 Member States, such as Brazil, Germany, France, Russia and Japan. They regularly discuss and decide UNIDO's guiding principles and policies in the sessions of its Policymaking Organs. Following the Lima Declaration adopted at the fifteenth session of the UNIDO General Conference in 2013, UNIDO's mission is to promote and accelerate 'Inclusive and Sustainable Industrial Development' (ISID) in Member States. The relevance of ISID as an integrated approach to all three pillars of sustainable development is recognised by the 2030 Agenda for Sustainable Development and the related Sustainable Development Goals (SDGs), which frame the United Nations and country efforts towards sustainable development in the next fifteen years. UNIDO's mandate is fully recognised in SDG-9, which calls to "Build resilient infrastructure, promote inclusive and sustainable industrialisation and foster innovation". The relevance of ISID, however, applies in greater or lesser extent to all SDGs. Accordingly, the Organisation's programmatic focus prioritises creating shared prosperity, advancing economic competitiveness, safeguarding the environment, and strengthening knowledge and institutions. Each of these programmatic fields contains a number of individual programmes, which are implemented in a holistic manner to achieve effective outcomes and impacts through UNIDO's four enabling functions: (i) technical cooperation; (ii) analytical and research functions and policy advisory services; (iii) normative functions and standards and quality-related activities; and (iv) convening and partnerships for knowledge transfer, networking and industrial cooperation. In carrying out the core requirements of its mission, UNIDO has considerably increased its technical services over the past ten years. At the same time, it has also substantially increased its mobilisation of financial resources, testifying to the growing international recognition of the Organisation as an effective provider of catalytic industrial development services. The General Conference (GC) is UNIDO's supreme policymaking organ where all Member States meet once every two years. It determines the guiding principles and policies of the Organisation, approves UNIDO's budget and work programme of UNIDO, and drives activities to strengthen UNIDO's thought leadership in the industrial sector Additionally, the Least Developed Countries (LDCs) Ministerial Conference is a key stream of the General Conference. The current Director-General of UNIDO, Mr. LI Yong (China), assumed office in June 2013, with the GC appointing the Director-General every four years. The GC also elects the members of the Industrial Development Board and the Programme and Budget Committee. Over the past eight years, the UAE has advanced 13 positions on the UNIDO Competitive Industrial Performance Index, which measures the performance of 150 countries around the world, ranking it 41st on the 2018 index, compared to 54th in 2010 and 43rd in 2015. The industrial sector is a key driver of economic development in the UAE and plays a pivotal role in enhancing the country's Gross Domestic Production (GDP). The UAE's dynamic industrial sector is not exclusive to oil derivatives, but includes multiple industries such as aerospace, defence, aluminium, building materials, food and pharmaceuticals, as well as industrial SMEs (small and medium-sized enterprises). The UAE is a vital part of the global supply chain ranking 11th in the World Bank's latest Logistics Performance Index. It is also a pioneer in testing Fourth Industrial Revolution (4IR) innovations. By 2021, key sectors of 4IR are expected to grow exponentially across the globe: Artificial Intelligence (AI) by 55.1%; blockchain by 61.5%; automation by 28.1%; and renewable energy by 40%. According to the UAE Ministry of Economy, roughly 6,300 factories in the UAE have been operational representing investments worth more than AED103.1 billion (US$ 28 billion) until the end of 2016. The UAE's Ministry of Energy & Industry is currently developing a strategy for the industrial sector by establishing a set of capabilities at the federal level in an effort to enhance the sector's contribution to the GDP. The strategy is being developed in cooperation with the relevant authorities in the UAE, with the aim of driving an increase in the sector's growth and enabling sustainable development. The new strategy indicates that these goals will be achieved through innovation, a reduction in carbon emissions, the support of SMEs, the stimulation of innovative industries, and a focus on non-oil sectors. The new strategy comprises clearly defined work programmes for each Emirate, including a programme to integrate the UAE's different industrial zones, maximising the purpose, strength and comparative advantage of each. Other programmes include the standardisation and modification of investment procedures for the industrial sector, and simplifying the issuance of industrial licenses and their merging in order to better appeal to investors. By attracting investors, the new strategy allows the industrial sector to realise its potential to build a sustainable, knowledge-based and innovative economy, in line with the national vision to increase the sector's contribution to GDP. The UAE has already succeeded in establishing a solid industrial base in recent years, and is now building on this momentum to bring about further growth and progress, and enhance its global competitiveness. The objective of maximising the sector's role in the national economy is also fundamental to UAE Vision 2021 and UAE Centennial 2071, striving to achieve a sustainable, diversified, knowledge-based and innovative economy with less reliance on oil. This would see the UAE on par with developed countries, where the industrial sector is one of the key pillars of any national economy. The UAE's prominence as a destination for major industrial companies at the regional and international level has been growing. The country offers numerous advantages, including a legal system that protects the rights of investors; security and political stability across the country including its major industrial zones; state-of-the-art infrastructure, roads and transportation, including international ports and airports, and logistics warehouses equipped with the latest technologies and human resources. In 2017, the UAE built 37 industrial zones and cities equipped with infrastructure facilities, roads, modern office complexes, and energy, with the aim of establishing competitive local industries and attracting investments. The zones include eight in Abu Dhabi, six in Dubai and 19 in Sharjah, Al Jurf Industrial Area (Ajman), Umm Al Quwain Industrial Zone, Fujairah Industrial Zone, and Ras Al Khaimah Free Industrial and Technological Zone. The Industrial Development Bureau of the Department of Economic Development - Abu Dhabi (DED), in cooperation and collaboration with relevant governmental and semi-governmental entities, is in the process of updating the Abu Dhabi Industrial Strategy 2016-2020. The new phase of the industrial strategy will focus on the next stage of providing and improving the business environment for the industrial sector in the short term. Over time, the strategy will support a number of targeted industries, which are dependent on some of the current key industries, as well as creating greater added value and better managing resources. During the course of the next three years, the Industrial Strategy will focus on empowering the UAE's industrial sector by focusing on the needs and requirements of performance in the business environment, such as industrial finance, intellectual property protection, and foreign property laws. The industrial sectors targeted in the updated strategy include aerospace, defence, industrial equipment, plastics and finished metal products, which will be supported by the major existing industries in the Emirate - steel, aluminum and petrochemicals. The Emirate of Abu Dhabi currently has eight industrial zones and cities, with plans to expand to nine zones by 2020. These areas focus on maximising the country's export capabilities, in particular petrochemical, iron and cement products. The zones also seek to attract investors and SMEs in order to contribute to sustainable economic growth by linking ICT infrastructure across the industrial zones and through the development of modern, high-end road networks and mega-ports. The Higher Corporation for Specialized Economic Zones (ZonesCorp) operates a number of dedicated industrial zones in Abu Dhabi, including the Industrial City of Abu Dhabi (ICAD) and Al Ain Industrial City. ICAD has five industrial zones and cities: the first Industrial City of Abu Dhabi (ICAD I), which specialises in heavy-to-medium manufacturing, engineering and processing industries, ICAD II, which is focused on light-to-medium manufacturing, engineering and processing industries, ICAD III, for light-to-medium manufacturing, ICAD IV for technology and light industries, and ICAD V, specialised in the automotive industry. Meanwhile, Al Ain Industrial City (I and II) is dedicated to light-to-medium manufacturing, engineering and processing industries. Meanwhile, the Nibras Al Ain Aerospace Park in Abu Dhabi's city of Al Ain, spanning 25 square kilometers, is a multi-faceted development that will consist of industrial projects, business, and office facilities, and mixed-use residential zones complemented with world-class community services and amenities. Jointly created by Mubadala Investment Company and Abu Dhabi Airport Company (ADAC), Nibras is a key driver in diversifying the emirate's economy and will focus on attracting Global Original Equipment Manufacturers (OEM), Industry Suppliers and Small to Medium Enterprises (SME) that can serve the industry. Abu Dhabi is currently implementing projects to develop new industrial zones and infrastructure in Al Dhafra, including Ruwais Industrial City, which focuses on the chemical, petrochemical, plastics, cement, oil and gas, building and logistics sectors, while the Madinat Zayed Industrial City will target oil, gas, food manufacturing and logistics industries. The Abu Dhabi Municipality operates the Mussaffah Industrial Area, which includes six specialised industrial zones. The first is focused on the automotive, machinery and auto spare parts sector; the second on food, textile and beverage sectors; the third on engineering, wood and herbal industries; the fourth on chemical, plastic and petrochemical industries; the fifth in construction related materials; and the sixth in advanced technology industries. Abu Dhabi Ports Company is developing the Khalifa Industrial Zone Abu Dhabi (KIZAD), located within Khalifa Port, which will become Abu Dhabi's main commercial port. The project includes a wide network of land, sea, air and network transmission lines. The industrial sectors targeted in KIZAD include petrochemicals, steel, pharmaceuticals, bio-chemicals, chemicals, biotechnology, metals, food, beverages, logistics and transportation. The industrial complex of Abu Dhabi National Oil Company (ADNOC) hosts a number of petrochemical industries. The complex includes an oil refining plant, a liquefied natural gas (LNG) cracker, a fertiliser plant, a seaport and a sulphur treatment plant. The UAE is committed to harnessing the technologies of the Fourth Industrial Revolution to achieve the UN Sustainable Development Goals (SDGs) and to advance global prosperity. The Global Manufacturing and Industrialisation Summit (GMIS), a joint initiative of the UAE and the United Nations Industrial Development Organization (UNIDO), is a global platform that gathers international industry leaders together to shape a transformative new chapter for the sector that will deliver a better future for all society. In doing so, the UAE government launched the Fourth Industrial Revolution Council, a first of its kind ministerial council in the world. As part of its remit, the council announced a Fourth Industrial Revolution (4IR) strategy that seeks to strengthen the UAE's position as a global hub for the 4IR and to increase its contribution to the national economy by means of advancing innovation and future technologies. As it pursues its vision of building a diversified, sustainable, and knowledge-based economy, the UAE is uniquely positioned to lead the global ambition to transform the manufacturing sector, and to utilise its established role in international cooperation to support other countries in achieving peace and prosperity. In a relatively short period of time since its founding, the UAE has succeeded in cultivating key businesses; its numerous companies in aerospace, renewable energy, mining, pharmaceuticals, petrochemical and defence are cutting-edge, and now form an integral part of the global value chain. The vision of His Highness Sheikh Mohammed bin Zayed Al Nahyan, Crown Prince of Abu Dhabi and Deputy Supreme Commander of the UAE Armed Forces, for the post-oil era, is an essential driving force for the development of the UAE's advanced industrial capabilities and to enhance the UAE's global competitiveness. These efforts fall directly in line with the Abu Dhabi Economic Vision 2030, which seeks to secure a diversified, knowledge-based and sustainable economy for generations to come. The industrial innovation brought about by the 4IR will transform the world as we know it, and the UAE is well-placed to become a hub for the development of next-generation technologies from across the globe. In doing so, the UAE will transition from an importer of technology to an exporter of knowledge, harnessing the potential of the 4IR and its immense impacts. The Global Manufacturing and Industrialisation Summit (GMIS) was established in 2015 to build bridges between manufacturers, governments and NGOs, technologists, and investors in harnessing the Fourth Industrial Revolution's (4IR) transformation of manufacturing, to enable the regeneration of the global economy. A joint initiative by the United Arab Emirates and the United Nations Industrial Development Organization (UNIDO), GMIS is a platform that presents the manufacturing sector with an opportunity to contribute towards global good, and that is committed to bringing benefit to all. As the world's first cross-industry initiative, GMIS offers a platform for leaders to engage on the issue of the future of manufacturing, highlighting the need for greater investment in capabilities to foster innovation and drive skills development on a global scale. Uniting key stakeholders - including world leaders, industry CEOs, and specialist researchers and academics - GMIS has placed manufacturing at the heart of economic transformation and government policy-making, promoting it as a tool for global cooperation and collaboration. The first edition of the Global Manufacturing and Industrialisation Summit was held under the patronage of His Highness Sheikh Mohamed bin Zayed Al Nahyan, Crown Prince of Abu Dhabi and Deputy Supreme Commander of the UAE Armed Forces, at the Paris Sorbonne University Abu Dhabi in March 2017. It brought together over 3,000 government, business, and civil society leaders from over 40 countries to advance manufacturing and industrial development globally, and to identify key trends and opportunities. The second edition of GMIS will be held in July 2019 in the city of Yekaterinburg, the fourth-largest city in Russia. The 2019 Summit is themed on "Nature-Inspired Technologies" and will build on the ground-breaking success of the first edition, ensuring that manufacturing adapts, evolves, advances, and retains its place at the vanguard of global economic prosperity.